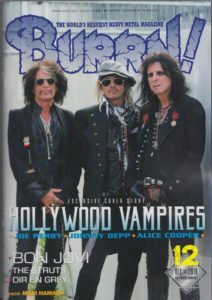 BURRN! December issue of 2018. BON JOVI special feature posting just before coming to Japan. In an interview with DAVID BRIAN, the memories in Japan and the thoughts for RICHIE SAMBORA are talked about. “Personality dictionary for deeper knowledge of BON JOVI” introduces 47 people who have participated in BON JOVI’s songwriting and live performances, such as band members, co-star musicians, producers and collaborative musicians. In the ranking plan, BURRN! Editorial department and writer writers have released BON JOVI’s best songs in ranking format.